All-natural active serums with a liposome delivery system that provides ten times greater absorption deep into our dermis layer where aging occurs. Osmosis Skin Care offers a collection of facial products that are safe to use on even the most sensitive skin because they are non-inflammatory. At Osmosis we avoid ingredients that weaken and inflame the skin but correct and repair DNA damage at the same time. Treating by skin type for a range of different skin conditions. 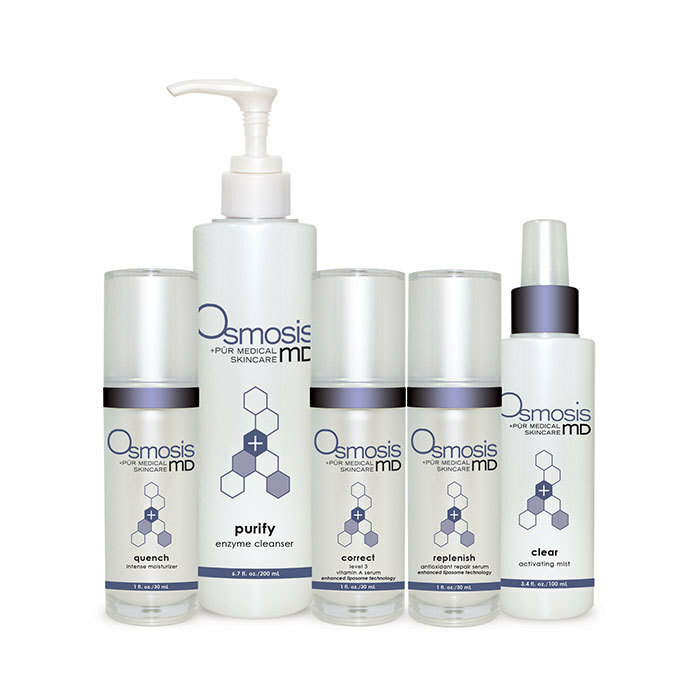 Osmosis empowers your skin and body’s immune system by providing innovative ingredients that spark tremendous repair. We target the source of skin conditions using the inside-out approach. Osmosis uses key internal dietary supplements supporting our holistic approach to health and treating the source of skin conditions. To treat imbalances and promote wellness these supplements are critical. Each category works to heal, rebalance and align the body for optimal wellness. These include Elevate, Complete DIM and Restore. Harmonized Water incorporates an energy therapy based on unique vibrational frequencies. Each Harmonized Water is formulated with scalar wave frequencies that enhance the cell’s ability to create optimal health. Osmosis Colour, a unique and exclusive mineral makeup that offers virtually seamless and natural looking coverage that will not look heavy, oxidize during the day or accentuate pores, fine lines and wrinkles. Richly formulated with amino acids, proteins and a complete spectrum of antioxidants to help nourish your skin along with zinc oxide for soothing benefits and UV protection. You will be left with only a subtle radiance that comes from having fresh healthy skin.